URL encoding aka URL escaping aka percent encoding is a mechanism for converting URL characters into a format that can be transmitted by HTTP. Reserved characters are replaced by a hexadecimal value preceded with a ‘%’ which is an escape character. 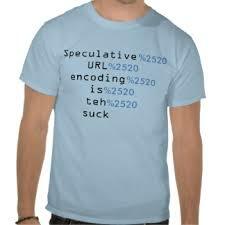 If a URL contains a space, for example, it must be encoded for transmission. Your browser takes a space and reformats it as %20. Siege, on the other hand, does nothing. It expects you to encode your own damn URLs … that is, until now! Percent encoding is available in siege starting with version 3.0.3-beta2. When it emerges from beta, the first stable version to support this feature will be 3.0.3. Really? Siege has been around since 1999 and you’re only now adding this feature? Booya! Just make sure you single quote the URL like in the example above. Since URL escaping is in its early stages, I’ve provided a mechanism for disabling it. Inside $HOME/.siegerc add the following: url-escaping = false The default value is true. Anything else in version 3.0.3-beta2 that we should know about? Why yes! We changed behavior for -g/–get. When you retrieve a page using -g/–get, siege sets its protocol to HTTP/1.0 so the page is human readable. We don’t need to read chunked encodings and neither do you. H/T: Your JoeDog would like to give a shout out to the folks at wget from whom he completely stole most of the code necessary to implement URL escaping. Cheers.